I really put those books through their paces this current Jewish holiday season. My menu ended up featuring the foods of the Turkish Sephardic Jewish community. A large reason for that was in remembrance of a friend who was of Turkish Sephardic heritage who was a wonderful cook. From Olive Trees and Honey I read up on some of the Turkish holiday food traditions. I also made some wonderful pumpkin pastries called borekas from that book. I took a number of ideas from a variety of cookbooks and added my own touches to create a Sephardic chicken soup with vegetables and matzoh-fafalel dumplings. From the Book of Jewish Food I adapted a recipe and created a chicken and black-eyed pea dish for my main course. I also served a vegetarian main dish of greens, potatoes and portobello mushrooms which was inspired from a traditional Turkish recipe. My version was adapted from the book Vegetarian Turkish Cooking by Carol Robertson. My recipe is very different from hers, but she deserves credit for sparking my imagination. As part of a mezze or appetizer plater I served small hot-sweet pickled cherry peppers stuffed with hummus (chickpea dip). Noah made apple pie for dessert. Now, apple pies aren't traditional Turkish Sephardic food, but apples are a European tradition for the Jewish New Year and Noah does like making apple pies, so that's how that came about. Here's my greens stew recipe. It is very flavorful and flexible. You can use other types of greens and it can be a main dish or side dish. First roast the potatoes. Preheat an oven to 450 degrees. Grease a baking pan with olive oil or oil spray. Add potatoes. Brush the potatoes with a bit more oil or use spray. Sprinkle with red pepper and salt and pepper to taste. Put in oven and roast until cooked through and browned, turning potatoes occassionally. This should take approximately 45 minutes or so. Prepare the tomatoes. Toss the tomato chunks with oil, vinegar and salt and pepper to taste. Set aside. When the greens are cooked, assemble the dish. Put the greens and mushroom mixture in a large serving bowl. Add in roasted potatoes and toss until combined. Top with a wide ribbon of the tomato salad mixture as a garnish. Note: Portobello mushrooms have dark brown-black gills under the cap. These gills darken any stewed mixture they are in. To avoid this, simply slice the gills off the underside the mushroom caps after you remove the stems. This is an optional step, but I do it whenever I want to avoid the coloration issue. Note: formatting, strange graphic errors and possible link issues since this is from a defunct site. I remember my first Jewish cookbook. It was a small paperback written by the matriarch of a famous resort in upstate New York that was well known for overstuffing its guests with mountains of chopped liver, lakes of chicken soup and continents of brisket, pastrami, and other Ashkenazi (German, Russian and Eastern European) Jewish food specialties like those I had grown up with. I was a college sophomore cooking on a hotplate and with a toaster oven that you had to flip over to use as a broiler. I made the book�s recipe for chopped liver. I don�t remember how the dish came out, but I do remember trying to chop the cooked chicken livers in a soup bowl with two dinner knives appropriated from the university cafeteria. 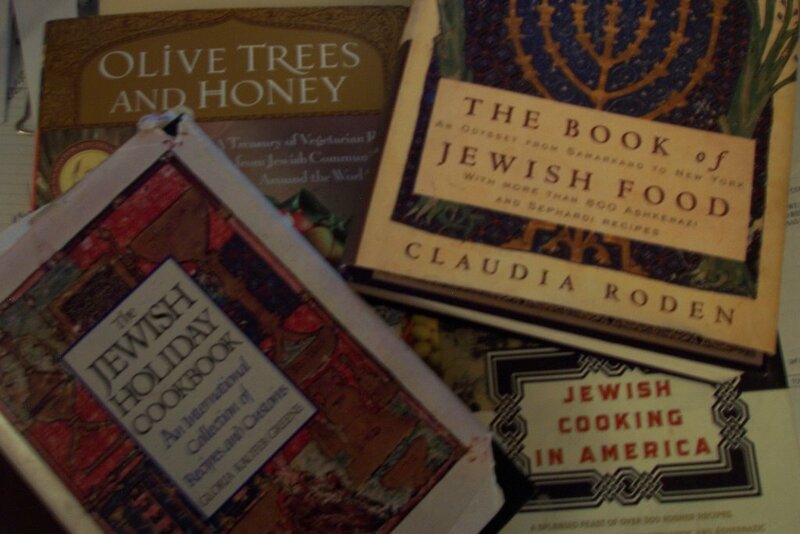 Over the years my Jewish cookbook collection has grown to include many favorites that I use year after year to plan my Sabbath and holiday meals. Because of my travels and culinary experience in foods from around the world, I often look beyond my grandma�s Ashkenazi dishes of blintzes, stuffed cabbage and matzoh balls to the Jewish cuisines of Italy, Morocco and North Africa, Turkey, the Mid East, Ethiopia, India and elsewhere. They all have a rich heritage of Jewish cooking which adapted local techniques, ingredients and flavors with religious and cultural requirements that included only certain ritually slaughtered animals and prohibited pork and shellfish and forbade meals mixing meat and diary. These recipes also tended to feature more vegetables than those of my Ashkenazi ancestors. The magic of the recipes from the Sephardic (a term which usually refers to Jews throughout the Arab world or former Ottoman territories whose families were originally from Spain and Portugal) and other Jewish traditions more than made for a tasty change of pace from the Eastern European foods most Americans consider �Jewish.� They really brought home the impact of the Diaspora, inquisitions and centuries of persecution on the everyday lives of people. Holiday dishes especially taught me more about Jewish customs, such as why certain foods are eaten at special times. They widened my conception of what it meant to be a Jew. Some of these cookbooks have information beyond the recipe about what life was like in these communities. Photographs show families dressed differently than mine, eating food different than I did, yet celebrating the same holidays such as Rosh Hashanah (Jewish New Year) and Passover. So much of Jewish holiday celebration is centered around a meal in the home I have had a chance to create menus based on a variety of traditions. These cookbooks are all recommended not just for Jewish holiday cooking but for all year-round cooking. You don�t have to be Jewish to try them (many are available at local libraries if you want to experiment before you buy); you just have to want to know how to make an outstanding chicken soup, a tasty stuffed filo �cigar� or perhaps a roasted eggplant salad. The New Jewish Holiday Cookbook, An International Collection of Recipes and Customs, by Gloria Kaufer Greene, is in a second edition published by Crown. (I still use the 1985 version.) This book is where I start when I research a menu. Her book, organized by holiday, includes the old familiar favorites of challah (a rich, braided egg bread), pot roast and potato latkes (pancakes). It also was my first taste of such exotics as a Greek mina, or spinach-tomato matzoh pie, for Passover. Greene does a good job explaining how the food fits into the holiday context. The recipes are clear, easy to follow and very dependable. This is an enjoyable book to read as well as cook from. Graphics are limited to a few drawings that illustrate challah braiding and pretzel twisting. My standbys from this book include the tangy Zippy Cranberry Pot Roast (usually served with my take on Greene�s potato latke recipe), Couscous aux Sept Legumes, and a fragrant, moist, flourless Sephardic-Style Orange-Nut-Date Torte. Jewish Cooking in America, by Joan Nathan and published by Random House focuses on how America�s Jews have adapted their immigrant food ways to the New World. The book is as much a history text as it is a cookbook, with explanations, photographs, first-person accounts, historical details and more giving invaluable insight into early settlers, food trends and more. There is less religious lore than in the Greene book, but the book�s cultural overview is outstanding. Nathan�s recipes are solid and come from Maine to Hollywood and have their roots in the traditions of Europe, the Mid East and North Africa. Recipes range from potato knishes to Pastel de Papa (Argentinian Potato Meat Pie). My standbys include Moroccan Brisket with Olives and Chicken Soup with Loads of Vegetables from the MGM Studio cafeteria. I have the first edition, a newer one published in connection with Nathan’s PBS program includes additional recipes. The Book of Jewish Food, an Odyssey from Samarkand to New York, by Claudia Roden, is a big book published by Knopf with more than 800 recipes that are divided into Ashkenazi and Sephardic sections. Roden�s strength is in her Sephardic section and it shows, it is about triple the size of the part devoted to European heritage recipes. The range of recipes she offers is astounding — from pickles and chutneys to cholents and dafinas (stews cooked in advance for the Sabbath) to Indian stuffed eggplants to recipes that are more of historic or cultural interest than culinary (I don�t think many Americans will be sampling her recipe for La Minima, chicken and calves� brains cake, but I bet if they did it they would find it to be tasty and well seasoned like all of Roden�s other dishes.) The book is crammed full of photographs, first person accounts, historical discussions as well as personal notes about Roden�s family culinary heritage. The selection is so vast it is easy to develop menus devoted to featuring the foods of a particular country. I am a big fan of her Italian Salsa Verde per Pesce (green sauce for cold fish), an Italian greens tart known as Torta di Erbe and Nanaeya, an Iraqi Jewish dish of lamb meatballs in a garlic and mint sweet-and-sour sauce. This is the book I have bought friends who want to expand their Jewish cooking repertoire. My only quibble is that recipes for Passover, the spring holiday commemorating the Exodus with its restrictions against leavened bread, flours and other grains, are not separated out in a section of their own. Both the Nathan and the Greene books have that feature. Olive Trees and Honey, a Treasury of Vegetarian Recipes from Jewish Communities Around the World, by Gil Marks, is my latest Jewish cookbook and one I tried to resist buying. �You don�t need another Jewish cookbook,� I tried to tell myself. �But look at this recipe. Read this,� I argued back. I left the store with the book and have not regretted it. Olive Trees and Honey, published by Wiley, also surveys Jewish food from around the world focusing in on vegetarian choices as well as seeming to adapt some classics to make them vegetarian. The recipes seem like they would work well. Their combinations of tastes and textures should mean that non-vegetarians won�t miss the meat. The book has lots of information about the background of the recipe and where it comes as well as discussions on specific ingredients and explorations of how certain foods (for example, savory pastries) vary from region to region. There is also a short discussion of the major holidays with suggested foods and flavors. Illustrations are limited to explanatory maps. Two quibbles with this one � there is no dedicated Passover section and no dessert recipes. Since I haven�t had this book long, I haven�t had much chance to cook out of it. I have tried the Turkish boreka pastry stuffed with pumpkin cheese filling. The directions were clear, the little half moon pastries came out of the oven golden brown and beautiful and the flavors were wonderful with the cheese softening the pumpkin�s astringency but not masking its taste. I look forward to trying the Georgian Red Bean Soup (with walnut sauce), Moroccan Spicy Tomato and Pepper Stew with Eggs, Filled Persian Crusty Rice (stuffed with green beans) and Marks� version of Ashkenazi Sweet Noodle Pudding. I want to mention the amazing Joyce Goldstein and her series of cookbooks focusing on Jewish Italian, Jewish Mediterranean and Sephardic cuisines. She is part food writer, part recipe detective, part anthropologist and part historian. Her recipes are detailed, authentic and sometimes require more cooking technique skills than the other cookbooks. The resulting dishes are full of flavor, texture and unique tastes, elevating home cooking to restaurant quality. Her books are also filled with luscious-looking color photographs of the dishes. Well Fed links are currently broken. I hope they are fixed soon. In the meantime if you need info from one of them email me through my profile. I can often find the "missing link" and email you back.